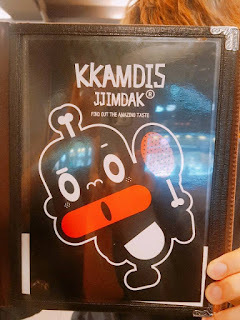 Korea Exposé has reported on a Suwon restaurant named Kkamdis Jjimdak (or "blackies jjimdak"), which, according to the owner, is the last-remaining branch of a franchise. A review of the restaurant in Korean can be found here. Attention was first drawn to the restaurant after photos of the menu, featuring the mascot below, were recently posted on Facebook. Ummmm...can anyone explain to me why a restaurant like this is allowed to exist? 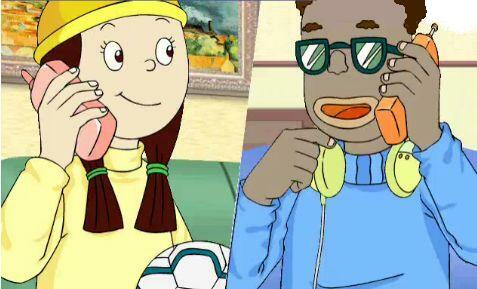 Isn't this incredibly racist? If you'd like to complain this is the number for the restaurant. [Phone number posted.] No one is asking them to close down the restaurant just remove the racist name and label. Thanks. This is absolutely not acceptable! This is supposed to be a depiction of a black person for their logo. This just opened near suwon station! If you go out exit 7 and follow the road you will see it across the street. If you're in the area please go inside and let them know that this is not okay. I have recently done so. Even if the people don't know better someone should educate them. I am not one to "try and change the country" but this is unacceptable!!!! 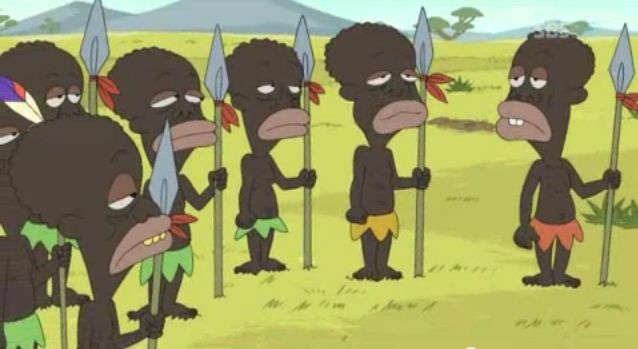 '깜디' is a short version of '깜뚱이' which is a derogatory word for African Americans. The owner of the restaurant was really scared. He said "I don't know what to do. I am so embarrassed." He said he had received a lot of threats via Facebook messenger and phone, so he deleted his Facebook account to block the disparaging comments. A reporter contacted him to get his story. He also said he didn't create the design. He just received the mural from the headquarters and applied it to his restaurant. He didn't expect that this design stir up controversy. The only thing I could do was to let him know the unfavorable post of his restaurant being unloaded in Suwon newbies. It takes a lot of time for the person who is not fluent in English, to understand what is going on in English speaking communities and compose an official apology in English. It begs the question that has been asked since the Dog Poop Girl: When does the response to a perceived offense become worse than the original offense? The restaurant is now featured on an American website as well. (If only Korean restaurants could be more like American restaurants, right?) Responses included assertions that Koreans should know better by now, and that all the owner needs to do is change the sign. 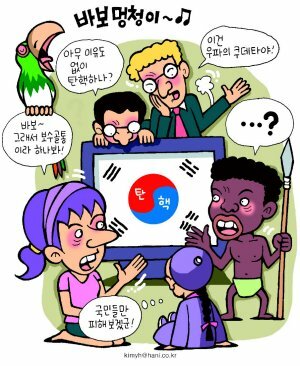 In response to the first assertion, I doubt that discussion of representations of black people seen as racist by non-Koreans has really spilled over very far beyond English-language discussions online. That this comes up frequently in these forums likely says more about their foreign users than about the degree to which it is an issue in Korean-language public discourse. As for the second assertion, a glance at the restaurant in that previously mentioned review makes it clear that not only the sign, but the tables, menus, posters, and more would need to be changed - not an easy thing for an independent business owner. Perhaps the people who are so concerned by the image could donate money to help him change the sign they find so offensive. That the owner said the character was supposed to look like the cartoon character Dooly is interesting. Dooly, of course, is green, has no bone in his hair, and wears no loincloth. This isn't the first time Dooly has been cited as the origin of a blackface-style image, however, as I noted in this post on the history of blackface in Korea. In January 2012 an MBC show featured comedians in black face, an act that was described in an apology by the production team as a parody of Maikol, (Micheal), a character from Dooly based on Michael Jackson. 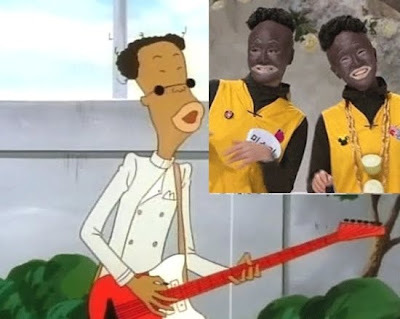 The appearance of such stereotypes on a children's show suggests at least one reason why such caricatures are not considered offensive to some people in Korea, especially since they have been embedded not just in entertainment but also in dictionaries and textbooks. While campaigns against the government or television networks to stop such practices are understandable, turning internet users against an independent business seems a bit over the top, particularly when the person who first posted this said he had already talked to the owner. "If I launched a dish called 'White Jjimdak,' all white people would throw a fit," he said over the phone. "People shouldn’t scrutinize every little thing. Foreigners who complained have an inferiority complex." An unhelpful comment (and one reminding me of the MBC staffer's response of "why are all these foreigners making a fuss over it? Maybe because they have a guilty conscience" in response to anger over an MBC show about interracial couples in 2012), but it seems to me to be the flip side of "I am not one to 'try and change the country' but this is unacceptable!" "...?" indeed. He looks about as primitive as some of those raging against peninsular racism seem to think Koreans are. You are in Korea. Liberal values and privileges do not exist here. If you are looking for Aristotelian logic, you will not find it here. Accept this and life will be easier for you.